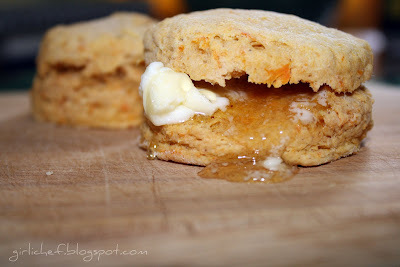 I'm going on a picnic and I'm bringing...warm sweet potato biscuits!! Louise at Months of Edible Celebrations is having an online picnic; "guests" bring pick dishes to bring by the letters of the alphabet...and I got 'W'. 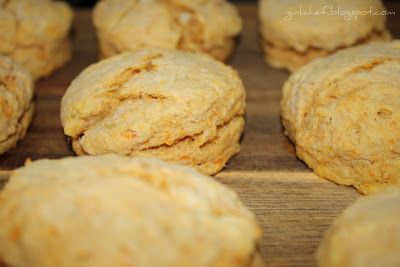 I was prepared to show you some delicious sweet potato biscuits...and since they are even better warm...I turned them into a 'W'! This is another test recipe I received through Cook's Country and another winner. I've often said that the smell of baking bread is one of my favorites...and I love to eat fresh baked breads and pastries and pies. The thing is, I'm not the greatest baker in the world. It's true, I'm a cook not a baker...but I do the best I can. I do fear yeast breads, which makes me sad because I adore them...but luckily there is no yeast in site in these little beauties! 4 Tbs. shortening, cut into 1/2" pcs. 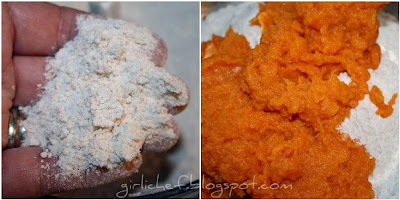 Prick the sweet potatoes and put into microwave until very soft, 15-20 minutes. Immediately slice in half. 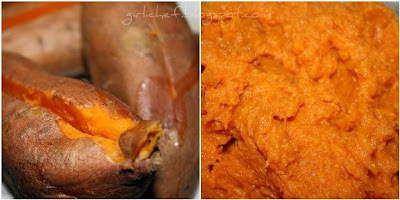 When cook, scoop flesh into bowl and mash until smooth...you'll need 2 c. of mashed flesh (if you have extra...eat it!). Stir in vinegar and refrigerate until cool. Preheat oven to 425 degrees F. Line baking sheet w/ parchment paper. Pulse flour, sugar, baking powder & baking soda, salt, chilled butter and shortening in food processor to form coarse crumbs. Add to cooled potatoes and fold in. 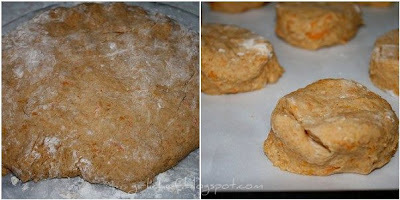 Turn out onto floured surface and knead until smooth, 8-10 times. Pat into a 9" circle, ~1" thick. 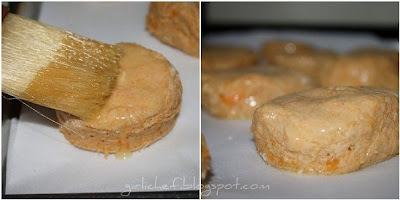 Using a 2 1/2" biscuit cutter (I accidentally used a 2" and thought it was perfect) dipped in flour, cut into circles and place on prepared sheet pan. 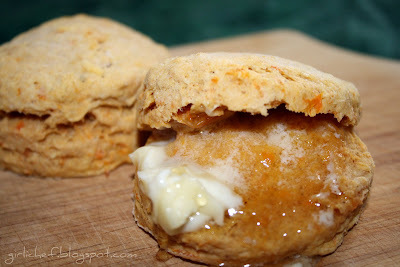 Brush tops with melted butter and bake until golden, ~18-22 minutes (17-18 was perfect in my oven). Let cool 15 minutes and serve. But remember...we're serving these WARM...which are awesome slathered with butter and drizzled with honey! !